Every girl needs a string of pearls. Actually, every girl needs a diamond or two, but who’s counting eh? 😉 Well, I like pearls. A long string of pearls or a pearl choker lends an air of elegance unrivalled by any other bling. Somehow, to me it screams “I don’t need bling to look glamorous!” and with pearls on, you don’t. A nice string of pearls can be very pricey though so most times, I’m just looking and gawking at places like Mikimoto, but never daring to touch. However, one day, while my mom and I were doing a spot of shopping, we came across a Shinju Pearls counter at Isetan (The Gardens) where we saw a long string of pearls that caught our eye. It was exactly what we were looking for, and imagine our surprise when we saw that it only cost RM99 for the long strand. I am assured that the pearls used are genuine freshwater pearls cultivated in Sabah and made in Malaysia. If you inspect the pearls carefully, you will notice that all the pearls in the RM99 strand are different, irregular and have stryations or slight imperfections on them. They are not perfect pearls in the sense of being uniformly large and perfectly round, but they are pearls, and they do it for me as they have that pearly lustre and glow and feel cool to the touch. I can wear them on an everyday basis without fear of them getting lost or stolen and that is enough for me. No point buying something large and expensive that I can only wear once or twice in a year, right? There are numerous other designs and colours available too but I opted for the natural creamy pearly white ones because I felt they were most versatile. I was also quite taken in by a strand that had dark coloured pearls on it so I might take another look again the next time I’m in the area. 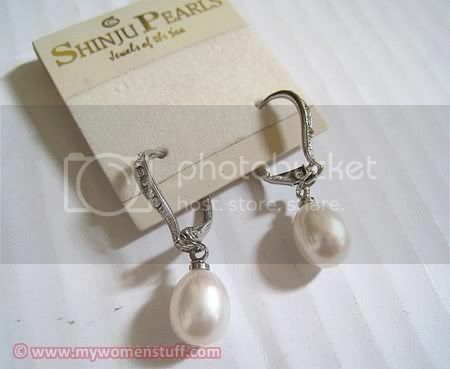 I also purchased a pair of delicate looking pearl drop earrings at RM55 that I thought was quite lovely. The metal is rhodium and there are sparkly bits of rhinestone embedded in it, but what I really liked was the teardrop shaped pearl hanging from it. It actually looks more expensive than the price belies. I’ve worn it a few times now and it lends an air of elegance to most of my outfits and did not break my bank – awesome! Shinju Pearls does have more perfect looking pearls on chokers but they do cost more too – RM200 upwards for a short choker – and they have other jewellery too including those made from stone or crystals. I tried on a few items and I find that their prices are quite fair and affordable for the woman on the street who wants something nice without having to break the bank to get it. For now, I’ve only visited the counter at Isetan at The Gardens and I’m told that there is a stand alone store at Lot 10, Kuala Lumpur with more choices. Some day, I’ll pop by there to take a look. Note: This was written from the point of view of a purchaser. I am not an expert and I do not claim to be one. I like it, I buy it. If it doesn’t do it for you, that’s alright because I’m not selling anything anyway! I love pearls.I wear them with everything and it’s amazing how well it goes with everything. Great buy! Hi geekchic: I’m starting to like pearls now – its actually possible to be edgy! Hiya Nikki: Well, if you are ever in town, you know what you should pick up! Pearls are lovely for weddings – it absolutely fits the occasion! the best i can wear it is a simple earring/ a single strand of pearls on my wrist. and that’s all. otherwise, ah~ i am better off wearing no accessories at all! Hi Plue: I used to think so too – but I guess it depends on what you are wearing at the time. Don’t need to over do it – just a simple pair of pearl earrings can do the trick. wow the prices are great! do they have a branch in singapore? i’d like to own a black/grey strand hahaha … and if cheap enough a pink strand too. Ohhh…. those are lovely! What a great price. I only own a cultured pearl necklace but I find it a bit too elegant to wear it to work. The long strand is really nice. I love long strand necklaces. I’ll probably check that place out when I’m in KL (12 more days to go!! :D). Heya Rinnah: Look at their other stuff too – you can get a nice matching necklace and earring set for under RM150! Hi Monstro: Yeah they are round but if you look closely at the real thing, some are imperfect but good enough for me! I’m not sure that Shinju does source pearls from Malaysia, nowadays most Fresh Water Pearls are from China – and there is some good quality there so I see no reason why people are still trying to make things up. Malaysian Edward Kong has some pricey Salt waters coming into the market. However, Shinju’s are probably strung in Malaysia though. I guess it doesn’t matter but I do hate it when retailers make things up. I do hate being told that something is MADE of Rhodium by everyone selling jewelry when it almost always used as a very fine plating. That’s misleading. Rhodium is more than ten times the price of yellow gold so very thin plate is all that’s usually practical. Rhodium is usually plated on White Gold or Silver and wears off over time so think twice about Rhodium plate on wedding rings as you’ll be re-plating with the jewellers every so often. I would go for real Platinum (not the same as White Gold) or solid Silver (no rhodium) at least you can polish it yourself at home. I buy a lot of jewelry to the point that I am now making my own so I know my materials quite well. Thanks for your comments. We aren’t experts and we have no reason to believe that what we were told was otherwise than the truth. Further to Jaded Shopgirl comment. Your comment are the most common of the layman comment who know only a little bit about jewelry and pretend to be an expert. No doubt platinum is much easier to maintain, so as gold. How many of your type willing to pay for the metal? Judging by your ‘knowledge’ i think I also need to shut down my 42 jewelry outlets in Malaysia. I dont see why any jewelry shop in Malaysia need to tell the whole world where their source of materials from, but i do hate it when some customers who pretend that they know about everything and hope to get a little bit more discount. All my outlets are within Malaysia, do I need to tell you where I got my gold, silver or platinum? Too bad that I do not sell jade, may be I should put it on website. I went to Edward Kong and boy, was I surprised. 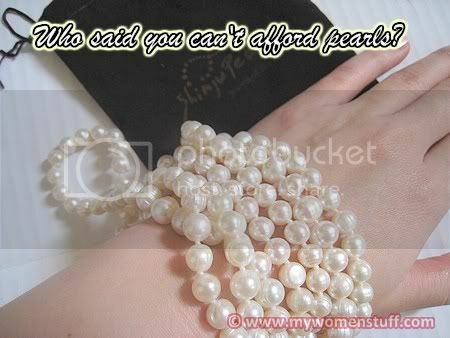 A simple strand of pearls is like RM10,000. Perhaps, I will consider mikimoto instead (I saw one similar there cost RM9,000 ish). I wonder whether they still RM99 promotion. feel a bit fire here over the comments. anyway, different prices get different quality, from the surface or the pearls to the luster….